If you’re having a Halloween party, why not create a spooky centrepiece using our Halloween tin ornament tutorial? 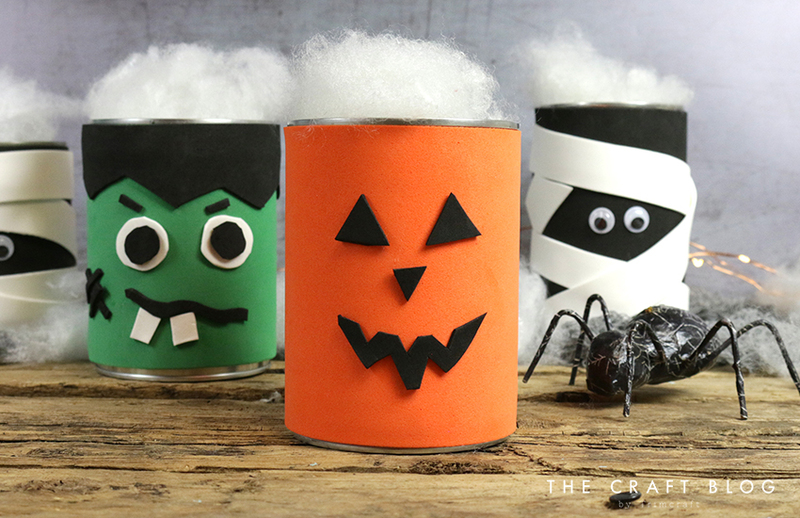 If you’re stuck for Halloween decoration ideas, using an old tin is a great place to start, and you can create a variety of designs, including a pumpkin, mummy, and Frankenstein’s monster. What’s great is that these are so easy to make, your whole family can have fun creating their own decorations! The Dovecraft A4 foam sheets are perfect for this project as they are so easy to cut into different shapes, so you can really enjoy personalising your tins. 1. Wrap a sheet of black A4 foam around your tin and cut to size. Adhere the foam to your tin with double sided tape, or glue. 2. Cut strips of white foam to create your bandages. 3. Add double-sided tape to the back of your white strips and wrap around your tin. 4. Repeat until you’re happy with how your tin looks, creating a bandaged look as you go. Leave a gap in the middle, to add your googly eyes. 5. Add googly eyes to finish. These really help to add some personality to your design! Your spooktacular mummy is now complete! What do you think to these DIY Halloween decorations? Will you be trying them? If you do, don’t forget to show us by using #Trimcraft when sharing on social media and to upload your makes to the Inspiration area! Looking for more Halloween inspiration? Why not take a look at our Top 10 Halloween Crafts for some super quick and spooky makes. Why not give our Halloween Box Frame tutorial a try too? !